Share the post "Professors Bhattacharya and Falkowski Lead International Team in Analysis of Coral Genes"
An international team has conducted a comprehensive analysis of coral genes, focusing on how their evolution has allowed corals to interact with and adapt to the environment. 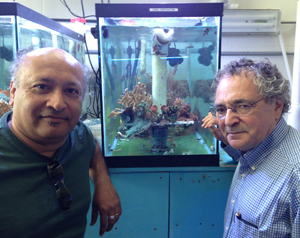 Professors Debashish Bhattacharya and Paul Falkowski led a coral gene database study that was published in the journal eLife. The study stems from an international coral genomics symposium and workshop held at Rutgers in February 2014 that was funded by the National Science Foundation. Also, a stony coral study was published in the Proceedings of the Royal Society B: Biological Sciences last month. Read more at Rutgers Today.